Japanese houses are made from specific woods that are easily available in Japan. 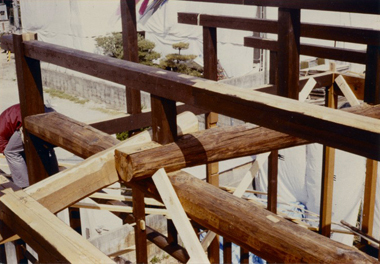 Upon inspection of The Japanese House, the carpenters found much rotten wood that needed to be replaced with specific Japanese wood. The Japanese House at BCM is a combination of old and new woods. Gleason, Paul. “Works and Woods: Architecture and ecology in Japan.” Harvard Magazine, September-October, 2008.